WASHINGTON – One of the tea-party leaders in Congress believes the days of Rep. John Boehner, R-Ohio, as speaker of the House of Representatives are numbered. Rep. Louie Gohmert, R-Texas, told WND he predicts Boehner will no longer be speaker “by next January,” regardless of the outcome of the midterm election in November. The issue of GOP leadership is a timely one because Gohmert just announced he has formed a political action committee, or PAC, called GOHconservative. The congressman told WND it was necessary to raise funds to protect conservatives from a “war on the tea party” waged by Karl Rove and other establishment Republicans. As Gohmert sees it, GOP leaders have stopped listening to the base of the party, which he believes is represented by tea-party groups. Gohmert said he believed tea-party conservatives represent the majority of Republican voters and described it as self-defeating for Republicans to alienate them. In fact, he suspected most taxpayers, including even Democrats and Independents, identify with tea-party ideals, based on polls he has seen. So, why would the GOP leaders go to war with a faction that represents the majority in their party, and perhaps a majority of all taxpayers? 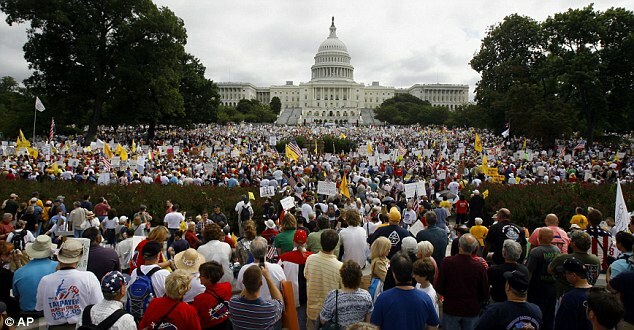 An estimated one million people attend 2009 tea-party protest in Washington, D.C.
Gohmert described tea parties as the GOP’s natural constituency, taxpayers who are tired of seeing government waste and abuse. “So, there shouldn’t be a fear of the tea party, there should be a fear of alienating the tea party,” he said. The lawmaker predicted that if the GOP disenfranchises tea-party voters, they will stay home on Election Day. Does he think a tea-party candidate could win the presidency? The Texan said, instead, the GOP needs somebody who has a track record of doing what he or she says, and that’s basically what the tea party wants. Does he think tea-party voters should support conservatives who challenge GOP incumbents in “safe seats,” even if, as some critics claim, that could hurt Republican chances of retaking the Senate? “I think it’s a good thing when there’s competition,” he said. He even implied that retaking the Senate may mean very little if leadership does not change. “I think if somebody’s not doing their job, they’re not keeping their promises, and we’ve got to have people who will do that,” he added. Gohmert feels GOP leadership is making a key mistake by listening to insiders like Rove more than tea-party voters, and he cited last autumn’s government shutdown as an example. The Texan was encouraged when Boehner initially supported the effort of conservatives to defund Obamacare in September as part of an attempt by Republicans to broker a deal with Democrats to keep the federal government funded. Should House conservatives try to replace Boehner as speaker? Should John Boehner be ousted as House speaker?